Looking at organizing your next event in New Caledonia? We understand how much easier it will be for you to ‘understand’ the destination and promote it to your clients or colleagues once you have seen it. This is why we are happy to help you with the organization of an inspection trip and cover these costs, should your project be confirmed in New Caledonia within 9 months of undertaking the inspection trip. 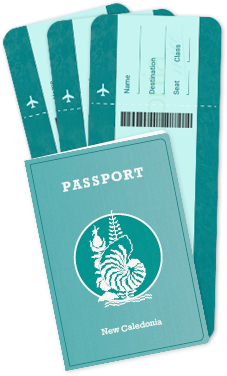 Return economy class airfares for two people departing from Sydney, Melbourne, Brisbane or Auckland to Noumea courtesy of Aircalin. Tell us more about your project by filling the form below. We will contact you within 48 hours. *Offer is subject to availability and is valid for deposited bookings of 20 guests with a minimum of 15 rooms for 3 nights. Bookings must be deposited maximum 9 months after the inspection trip is undertaken. If the conference or incentive group booking is not booked within the 9 months time frame, you will be invoiced for the services supplied during the site inspection. Extensions of travel at your own costs. Offer not transferable. Flights must be booked on Aircalin. New Caledonia Tourism will review the validity of each project individually.